"Forty years ago, the biggest TV audience in history tuned in to watch humankind's first close encounter with another world, as the crew of Apollo 8 reached lunar orbit. Here, the Apollo historian and film-maker Dr Christopher Riley gives his perspective on the mission and how that Christmas Eve of 1968 changed the world." 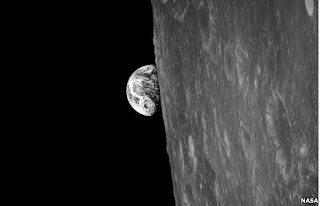 Picture from NASA - the first image of earthrise ever taken from the moon. Cool.